The number of rough sleepers on the streets of England has risen for the sixth year in a row, with over 4,000 people spending a night outside in 2016 alone, new official figures revealed. Numbers were up by 16 percent from last year and have more than doubled since 2010. The majority of rough sleepers live in London, Brighton and Cornwall. A staggering 260 homelessness cases were reported in the wealthy borough of Westminster alone – a stone’s throw from Parliament. However, in reality the problem could be even worse than the figures suggest. Guardian newspaper analysts found that, if population size is taken into account, more than 100 local authorities witnessed rates of homelessness above the national average. Using these calculations, other wealthy parts of the country to have seen high numbers of rough sleepers on their streets include Cambridge, Oxford and Canterbury. “Behind these statistics are thousands of desperate people, sleeping in doorways, bin shelters, stations and parks – anywhere they can find to stay safe and escape the elements,” Crisis charity chief executive Jon Sparkes told the Guardian. Most rough sleepers were found to be British nationals, with only 5 percent coming from outside the European Union. Nearly 90 percent of them were men over the age of 25. Campaigners point out that official figures only count those people sleeping or about to bed down openly on the street, or in areas not designed for habitation like doorways, bus shelters, cars, sheds, tents and parks. Homeless people living in shelters, hostels or any other temporary accommodation are monitored in separate statistics. But according to homelessness charity Shelter over 250,000 people in England currently have nowhere to live. “The number of people sleeping rough fell under Labour but has more than doubled since 2010, and has risen every year under the Conservatives,” Shadow Housing Minister John Healing commented in response to the figures. 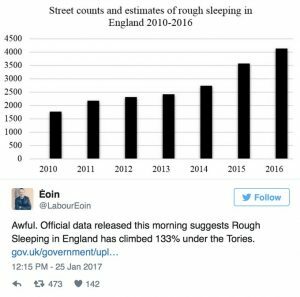 Many believe that the true rough sleeping numbers are far higher than those recorded by local authorities. A database collected by St. Mungo’s Combined Homelessness and Information Network reported more than 8,000 homeless people on the streets of London over the year of 2015-16 alone. 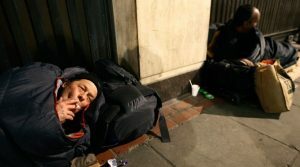 Government spokespeople argued the Conservatives were investing £550 million (US$690 million) to address homelessness by 2020. “Homelessness is more than just a housing issue so we are now funding projects in 225 local authorities to help those people at risk of becoming homeless, already sleeping rough or those with complex needs, to get back on their feet,” a spokesman told the Guardian.